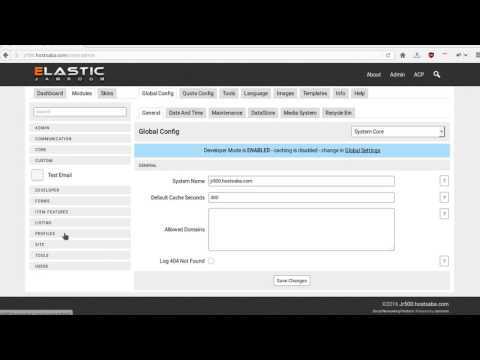 Video: "Left hand menu in the ACP"
The Admin Control Panel or "ACP" is the location where the master admin can set up all the module and skin configuration for the entire system. It is where modules are installed and activated and where the active skin is selected. The ACP control panel is the central place for configuring and customizing your Jamroom site features and Quotas. ADMIN - Contains modules that relate to the admin user. Modules like "Change Item Owner", "Support Tickets", "Admin Hover Menu" can all be found in this section. COMMUNICATION - Contains modules that relate to how your site communicates with users, so modules related to sending emails are found here. CORE - Contains modules that are part of the core Jamroom system like Image Support and Marketplace can be found here. CUSTOM - Contains modules that have been built for you and are not available in the marketplace for everyone. DEVELOPER - Contains modules that are useful for developing Jamroom modules and skins and working on your site, like the "Developer Tools" module which allows access to the database. ECOMMERCE - Contains modules that are related to selling stuff from your site. FORMS - Contains modules specifically designed to enhance or alter forms on your site. "Editor Embedded Media" and "Simple Custom Forms" modules are found here. ITEM FEATURES - Contains modules that do not create an item of their own, but rather add features to existing items created by other modules. "Comments", "Item Ratings", "Item Tags" and similar modules are found here. SITE - Contains modules that relate to your site in general, not specifically just the profiles. "Site Builder", "Smiley Support", "Media URL Scanner" are all found in this section. USERS - Contains modules related to users. "Playlists", "Strong Password" "Play Control" are all found in this section. The screenshot to the left shows the CORE section expanded and all the modules in that section are displayed. Graph Support , Image Support , Marketplace , Support Center , System Core are all installed and active in the system. Only the System Tips module is currently inactive. You can tell its inactive because it has an indicator marker to the right of it and its at the bottom of the list of modules in that section. To activate it, you would click on the module, navigate to the INFO tab where you would see the option to activate that module. The admin user can activate modules by clicking on the "Module Active" checkbox and SAVE CHANGES. The screenshot above shows the System Core module as the current selected module. Along the top of the modules interface you will see a series of tabs. The currently active tab is the TOOLS tab. This is the TOOLS tab of the SYSTEM CORE module. GLOBAL CONFIG - This tab is where universal settings for the module are set, things like an API key to connect to Youtube in the case of the Youtube module, or System Date and Time in the case of the System Core module. Settings that are the same for all users of the module. QUOTA CONFIG - This tab adjusts the access levels of quotas. You may have some quotas that are allowed to use the module and others that are not. Eg: Some profiles may be allowed to add Audio Files while others are not. LANGUAGE - This tab holds all the language strings that are used by the module. When you have multiple languages you can translate the module here. If you want to change the text that is displayed by the module, you can do that here too. IMAGES - This tab holds all the images used by this module. If you want to upload a different image to replace the existing one that is used, you can do that here. TEMPLATES - This tab holds all the template files used by the module. Template files are what is displayed on your site, so if you want to adjust how something is displayed you can modify the HTML content of any template file here and it will effect how that item is displayed on your site. The most common use for this would be for modules like Audio , Youtube , Gallery and such when you wanted the list displayed in a different format. You can use the Template tab to move things around. INFO - This is where you see the info on the module and also activate and deactivate and delete it. When you install a new module from the marketplace, you will arrive on its INFO tab. From here you're expected to activate the module you just installed. Version number of the module can be found here. HELP - If you have the Support Center module active this tab will show for all modules. It connects your ACP with the documentation section on jamroom.net to help you easily find documentation on the module you're looking at. Special modules may have extra tabs that only they have created. Many modules have common sections as was shown above, GLOBAL CONFIG , QUOTA CONFIG , TOOLS ...... are very common locations amongst all the modules in the ACP. When you are on one of the tabs that is one of these common locations you may see a drop down menu to the right of the page with a list of other modules on it. This is the [b]Location Jumper[/code]. It will take you to the same location in the module you select to save you a few clicks. Your on the TOOLS tab of the SYSTEM CORE module and you want to go to the TOOLS tab of the AUDIO module. Its just another way to navigate around the ACP. The Search box at the top of the left hand column is used to just search the modules section of the ACP. While you in the MODULES area of the ACP typing anything into that search box will only search the currently installed modules and settings. You can use this to find settings and tools that you can't recall the location of. eg: type: "quota browser" and the Quota Browser tool from the Profiles module will be returned. The SKINS section of the ACP is very similar to the MODULES section except that it instead of modules in each section, you will see all the skins installed in the system. Use this area to change the active skin and to update GLOBAL CONFIG for the skin you are using. The one tab that skins have that modules do not is the STYLE tab. STYLE - This tab allows you to edit the CSS for the skin. This is where you can tweak the colors and font styles that your skin is using.